Stewart Hosie says Scotland could make a Norway-style model work. Picture: Michael Gillen. STEWART Hosie has indicated that a Norway-style model for Scotland to remain in the EU could be the preferred choice. The former deputy leader of the SNP says the party has been exploring various options to ensure that Scotland can be a part of the European Economic Area (EEA) - even if the rest of the UK state leaves completely. 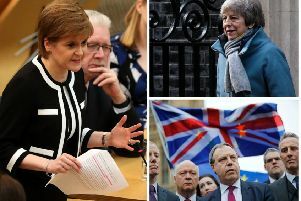 The SNP’s preferred option, which First Minister Nicola Sturgeon has yet to reveal, is likely to be based on a Norway-style deal, where Scotland pays to stay in the single market without being a member of the European Union. Speaking to The Times, Hosie appeared to suggest that the Norway model was emerging as a clear front-runner: “We could make it work. “Many suggestions have been posited. The announcement will be made at some point reasonably soon but, for example, if we were to stay in the European Economic Area, we would remain members of the single market. That would require us to have free movement of people”. He added: “We in Scotland and the Scottish government don’t see that as a problem at all. “The UK does. So while it might be complicated, there is a way in which we could remain in the single market, trading, not being subject to additional tariffs and all the rest of it and if the UK wanted to do something different, then there is a way we could make that work”. Mr Hosie’s view was backed up by Sionaidh Douglas-Scott, Professor of European and Human Rights Law at Oxford. Professor Douglas-Scott is working as a Brexit adviser for the Scottish Parliament and has said that a scenario where Scotland stayed in the EEA without the rest of the UK was possible but “difficult”. The legal expert says she thinks there would be significant “technical and legal” hurdles to negotiate and that any such agreement would require the full cooperation from the UK government which deals exclusively with Brussels.